Concrete parking stops are another safety feature added to your parking lot to help prevent vehicles from causing damage to buildings, and to also keep them off of sidewalks or other restricted areas. You will see wheel stops commonly used at retail businesses, churches, schools, and basically anywhere you have a public parking area. Not only do concrete wheel stops protect buildings, but they also protect metal signage, utility poles, and other vehicles. Our professional team is ready to help you with the installation of your wheel stops today. 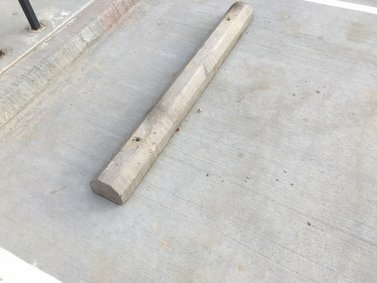 When choosing and installing a concrete wheel stop, the overall dimensions of the parking area or curb determines the dimensions of the stop to use. 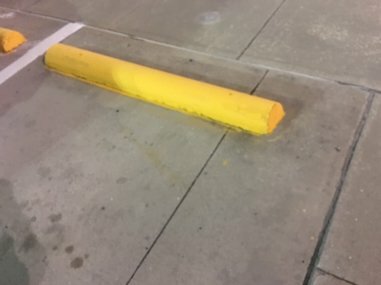 The dimensions of the wheel stop used in your parking lot will vary in length and shape to accommodate your parking area. The main thing is to provide maximum durability and safety for the patrons in your parking lot. The standard height of the block will only come into contact with the tires of the vehicle, minimizing damage to the actual vehicle. The decision to buy a rubber or concrete wheel stop is a decision you may face as a business owner. Each of the two has their own pros and cons, and we can help you in making the right decision. Concrete wheel stops are most durable and are a great choice for any parking lot or parking garage. The durability of concrete blocks are better, since they are not affected by extreme weather conditions, unlike the plastic wheel stops which may become brittle or lose shape in extreme weather. Considering the ease of installation, concrete blocks are heavy and demand more manpower during installation, while plastic blocks are light and easy to install. In matters of cost, concrete blocks are more expensive than plastic, especially in the case where recycled plastic is used in the place of new plastic. Concrete wheel stops are meant to protect structures from damage by oncoming motor vehicles, but should also act as a deterrent for motorists from driving on sidewalks. They may be tiny, but they make a big impact on road safety. ​We are ready to assist you with all of your parking lot service needs. We do offer free quotes for the entire project and look for ward to hearing from you today. We also provide fire lane striping, metal signage installations, and ADA Compliance.